All our jigsaws are cut by hand using a treadle-operated fretwork machine. This may seem a trifle primitive in the 21st century, but we find that it is the only way to get the essential co-ordination between eye and hand in order to create the effects we want. 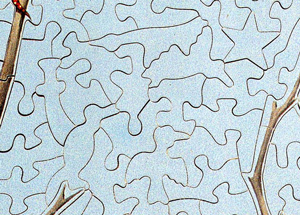 As a result, every jigsaw, even one of the same picture, is unique. We always cut in as many shapes as we can. Any shape that has an identifiable silhouette has potential. To make the jigsaws even more tantalising, corners are cut through, straight edges are not restricted to the side and we invariably cut along colour boundaries. This not only makes the jigsaws much more difficult to assemble but it also brings out the best in the original picture. The jigsaws are made from high quality 4mm Finnish Birch ply. 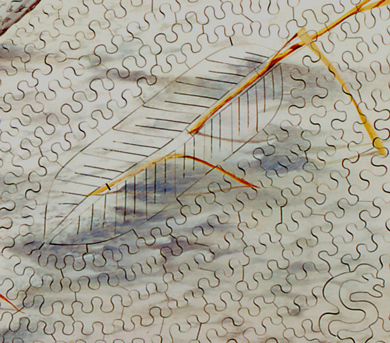 In the top left picture, a leaf has been created in the cutting where no leaf existed in the picture, as if part of the winter twig, itself outlined. Notice also Simon’s signature in the bottom right-hand corner. 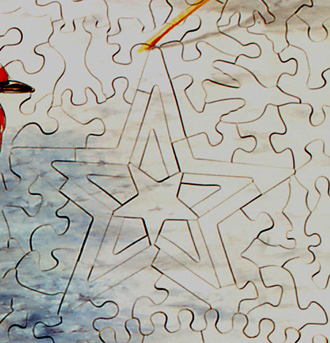 The picture above shows our characteristic 'star round a star' and a falling man above it, probably driven to extreme measures by the difficulty of the jigsaw, whilst in the picture to the left there is a scimitar, a star, a perched bird, a hovering bird and two flying birds, the wings of one fitting into the wings of the other. The three pictures below show two of our favourite techniques: ‘composites’ (A) where shapes are composed of several pieces and ‘mosaics’ (B) where several shapes lock into one another. There are many special shapes cut into the jigsaw in the left-hand panel, but I have extracted into the centre panel two individual shapes – the hammer and the diving swallow – together with a few of our special features, as examples of what we enjoy doing. The right-hand panel shows four of them exploded into their individual pieces. The Eye of the Pyramid, 15 by 20 inches with 1057 pieces. Escher's Birds, 15 by 16 inches with 741 pieces. 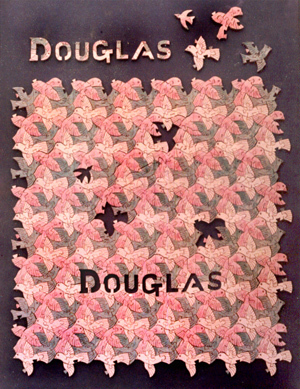 Each bird was cut into five almost identical pieces, and the border was as you see it. Extraordinarily difficult. When we cut jigsaws to order we will, if asked, cut pieces into the shapes of letters to spell out a name or a brief message. 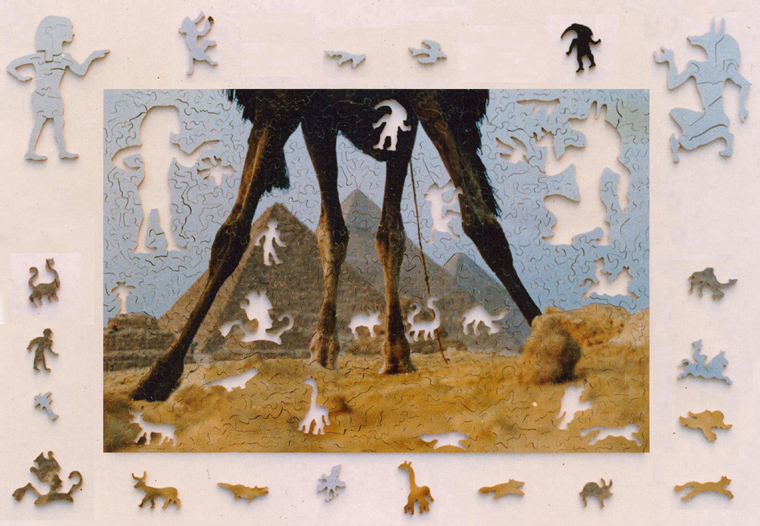 These do not spoil the completed puzzle – indeed you have to look carefully to pick the message out – but they are very evident to the person assembling the jigsaw. The jigsaw to the left is an illustration of this. We also enjoy conspiring with our customers in devising mischievous ways to entertain and to tantalise whoever is going to put the jigsaw together. In a recent jigsaw we cut in the message "GUESS WHO'S GOT THE LAST SIX PIECES?". The customer kept the P,I,E,C,E and S and sent the jigsaw off to her friend as a Christmas present. It was not until February that her friend rang, mock-irate but delighted; after all, there is no jigsaw more difficult to assemble than one with pieces missing.